Mom Loves 2 Read: Ringling Bros comes to Peoria Civic Center! Check it out on Loves 2 Read! Ringling Bros comes to Peoria Civic Center! Check it out on Loves 2 Read! Ringling Bros. and Barnum & Bailey introduces the Ringling Bros. Ringlettes, who are the stylish hosts of the swankiest circus party in town. The Ringlettes are ready to invite Children of All Ages in on the hippest circus spectacular that The Greatest Show On Earth has ever produced! Get ready for epic Asian elephants, high-flying acrobats, mind blowing motorcycle mania, and much more! Don’t forget to attend the rocking 1-hour pre-show party free with your ticket! So get your tickets today before the train leaves the station! Ticketmaster outlets, online at Ticketmaster.com or charge at 800-745-3000. ** Service charges and facility fees may apply. 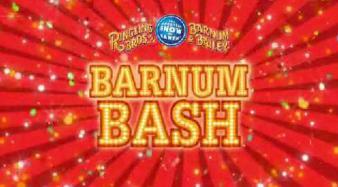 Ringling Bros. Presents BARNUM BASH has assembled the most amazing international acts including The Mighty Dmytrio, Motorcycle Mania, Epic Asian Elephants, Wheel of Steel, and Hand Balancers. All are tricked-out for the circus party and ready to perform wild feats of wonders and strength, to contemporary pop music and in 21stcentury Barnum style. Everyone who is anyone is invited to the party, except Anton, a loveable, goofy hipster clown, who just wants to be part of the fun. Ringling Bros. Presents BARNUM BASH is all the rage with outlandish thrills, hilarious high-jinks and majestic animals, but can Anton, with his non-stop laughable antics, persuade us all that there’s not just one right way to party!?! I was offered a chance to review this show through FFA (Field Family Activators) but I am unable to attend. In exchange for this promotional and informational post, I was offered tickets to a future event at the Peoria Civic Center in which I will post a review at a later date.